Spoiler alert: it’s Schwartz’s, in Montreal (pictured above). But you already knew that. 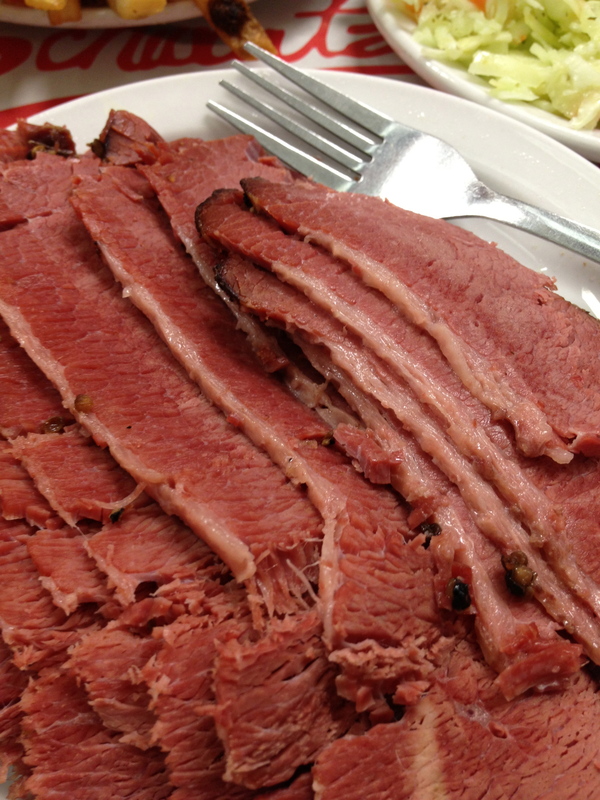 Now, instead of making silly comparisons, let’s talk about the smoked meat in Halifax. We’ve recently visited two restaurants, on the same street, that are claiming to have smoked meat as one of their specialities. Okay, to be fair, Hali Deli is also claiming many other dishes on their menu, the traditional Jewish fare, to be specialties. Sully’s Roast Beef & Smoked Meat is pretty much just serving smoked meat, with very few other menu options, and a confusing Irish twist on their branding. Smoked meat sandwich at Sully’s. I already mentioned Sully’s in the my last post, about brunch. Geir did have the smoked meat on that trip, and he was pretty satisfied with it. I also tried it. The sour pickle claims to be the same as those used at Schwartz’s, and it was pretty awesome. The meat is smoked in-house, and cut very, very thin. 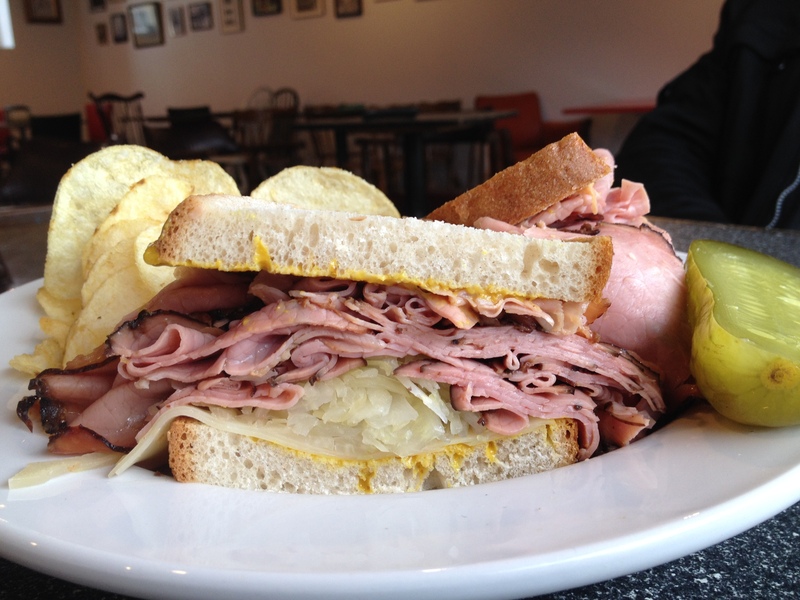 It is piled on the sandwich with your choice of mustard (Geir chose HOT), sauerkraut, and swiss cheese. It is served on light rye. There are no fries on the menu, so plain potato chips must satisfy any salt craving. This was a decent sandwich, but was missing meaty substance and texture, having been sliced as thin as deli meat. Also, there were a lot of inconsistencies with what Sully’s had listed on their menu and what was actually available when we were there. I get they’d only been open a couple weeks at the new location, but to have a draft machine with local beer tap handles, sit empty, is just cruel. When we walked into Hali Deli Old World Delicatessen, I immediately liked it. They truly have accomplished the old school diner feel — to me that place could have been there for the past 40 years. Again, Geir ordered smoked meat but this time in the form of a reuben, one of his favourite things to eat. 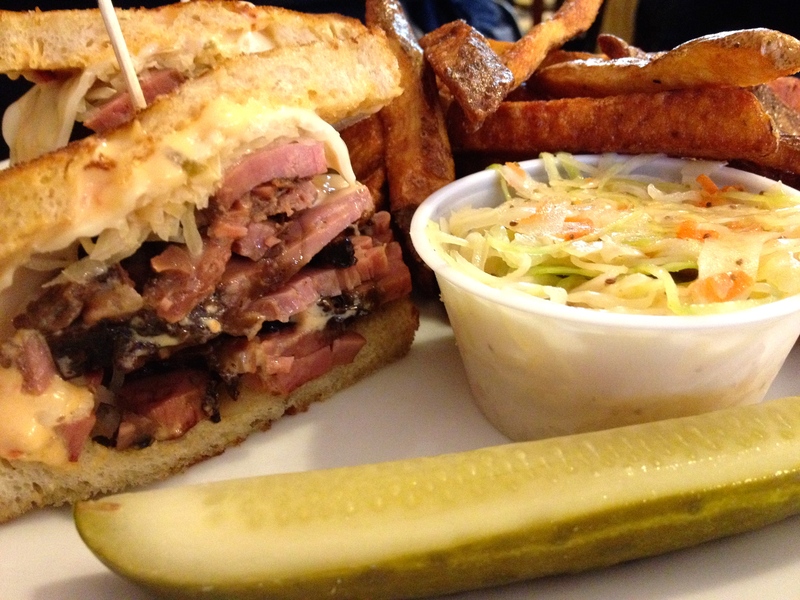 The meat is cut thicker, more Montreal-style, and and is complemented by the traditional rueben fixings: dressing, sauerkraut, swiss cheese. There is French’s and a big brand “bold deli-style” mustard on the tables (no true Dijon or hot English mustard). This sandwich is better; it’s served with house cut fries and slaw, as well as a fantastic pickle. I ordered a salmon burger, which consists of two house-made salmon patties on a bun with tomato, lettuce, onion and homemade tartar. I’m a huge fish burger fan and I enjoyed this. I also love that Hali Deli has the breakfast part of their menu available all day. We’ve already been back once since this first visit — Geir ordered the rueben again and this time I had the lox schmear platter: lox (cured salmon), chives, red onion, cream cheese mixed together, served with a toasted Montreal-style bagel, lettuce, tomato and cucumber. I also had their super garlicky caesar salad, for which they use the smoked meat cracklings instead of bacon. Loved this! We had a delicious milkshake on both visits, as they are not licensed. Next time, I plan on trying some of the Jewish dishes on the menu. Salmon burger at Hali Deli. Our spread at Schwartz’s in Montreal last June. A reuben at Reuben’s, in Montreal. 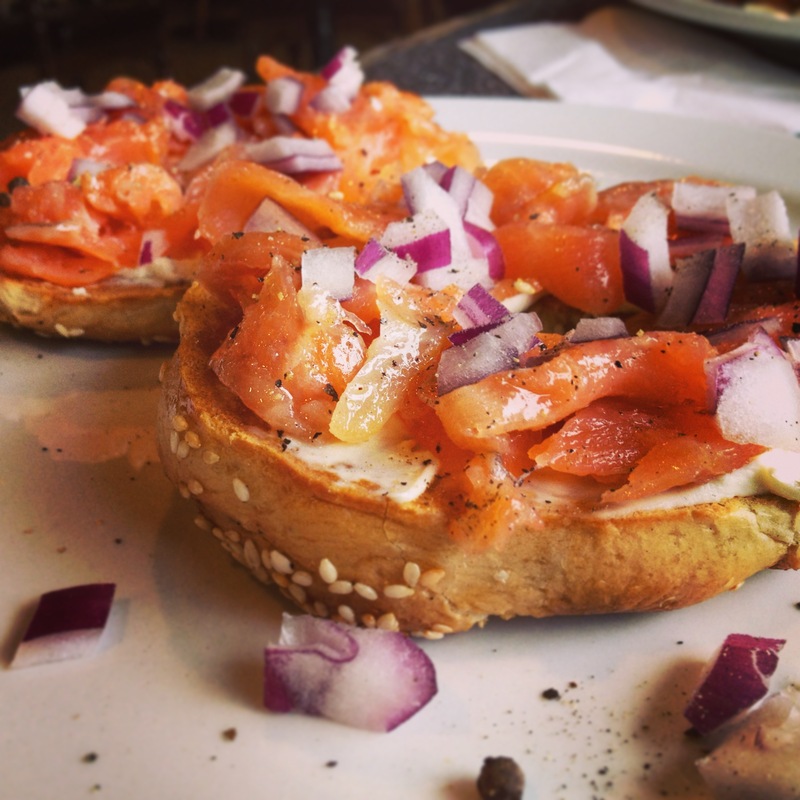 Smoked salmon bagel at Sully’s. If you follow me on Twitter or Instagram, you may have noticed, I eat a lot of brunch. Like, a lot. I never miss a weekend brunch. And while I do appreciate creativity on a brunch menu, I’ve found time and time again, you don’t really need to stray far from the classic flavour combinations to create a satisfying brunch experience, especially if they’re done well and with a little love. BLT + fried egg at the Tin Pan. For example, we spent a night in Grand Pre during ice wine festival last month, and on the recommendation of our amazing server at Le Caveau the night before, ended up at local institution The Tin Pan in Port Williams. Now, The Tin Pan, in reality, is someone’s home and their dining area is what was once a living room, and in many ways still feels like it. They don’t even have commercial kitchen equipment. 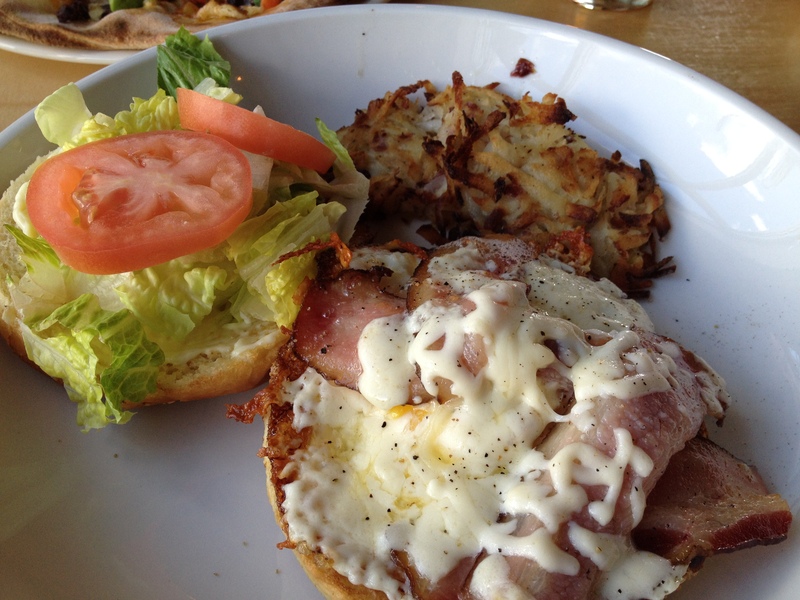 We ordered a couple B.L.T.’s (served on homemade bread) plus a fried egg, and pan-potatoes. Amazing. Cash only. Smoked salmon croissant at Tess. Another example was our recent visit to Tess. Aside from having unbelievably reasonable prices, this is another small, quaint neighbourhood go-to that serves consistent, simple brunch items (and of course their famous crepes). 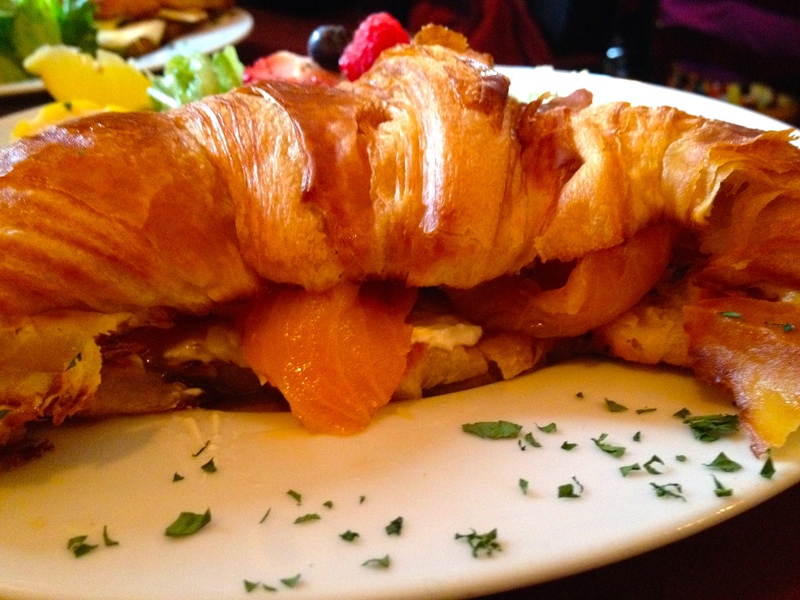 My dish was a combination of smoked salmon, cream cheese, maple syrup and capers inside a buttery croissant. The sweetness of the maple really balanced out the smokiness and acidity of the other ingredients. The rich buttery goodness of the croissant made this an outstanding take on one of my favourite things to eat for brunch, ever. 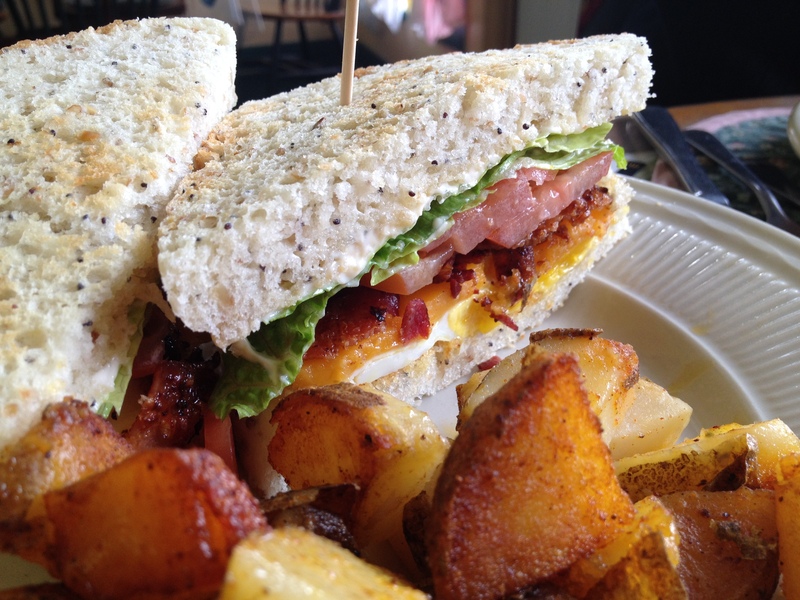 The breakfast sandwich at Morris East, Bedford South location. Morris East has expanded their brunch offering in the past few months and now serve up this little beauty, a classic breakfast sandwich. Local bacon and cheese, a fried egg, lettuce and tomato on the exceptionally soft buns baked by Boulangerie La Vendeenne. Add some kind of potato on the side, in this case a rosti, and you’ve got brunch. Plus they have a deadly caesar featuring their house-made clamato mix. Where’s your favourite joint for a simple, sometimes greasy, brunch fix? Our place settings at The Tin Pan. Interior of The Tin Pan. The breakfast sandwich at Morris East. The Montreal smoked meat sandwich at Sully’s.